INDIANA, PA – It was a bittersweet ending to the 2018 FloNationals on the campus of Indiana University of Pennsylvania. Pennsylvania wrestlers went 1-for-8 in the Championship finals with the lone winner being Glendale rookie Brock McMillen at 113 pounds. Overall Pennsylvania totaled 30 medalists at FloNationals. In the finals McMillen, a 2018 PIAA State runner-up, took on Missouri junior Kai Orine who entered FloNationals as the top seed and a #12 ranking in the Nation up a weight at 120 pounds. Brock was flawless in a 6-2 decision over Orine picking up two takedowns in the third period to clinch an impressive tournament. It was Brock’s first break-out victory of his young career on the National stage – having knocked-off returning PIAA State Champion Beau Bayless (Reynolds) in the State semifinals. McMillen was one of eight FloNational finalists from the Keystone State with seven of the State’s top wrestlers taking second. Junior Sean Pierson (Nazareth) dropped a 9-5 decision to Colorado sophomore Dominick Serrano in the 120 pound finals. Serrano entered ranked #16 in the Nation by Flo up a weight at 126 pounds. At 145 pounds Pennsylvania State runner-up Kolby Ho (DuBois Area) was unable to close out a tight match in the finals against Ohio’s #17 Mike North. 2017 PIAA State Champion and Virginia recruit Justin McCoy advanced into the finals at 152 pounds, improving on his fifth place finish from a year ago at the FloNationals. He was unable to take the top spot falling to Wisconsin senior Peyton Mocco 8-3 in the finals. Mocco came in ranked #14 at 160 pounds. 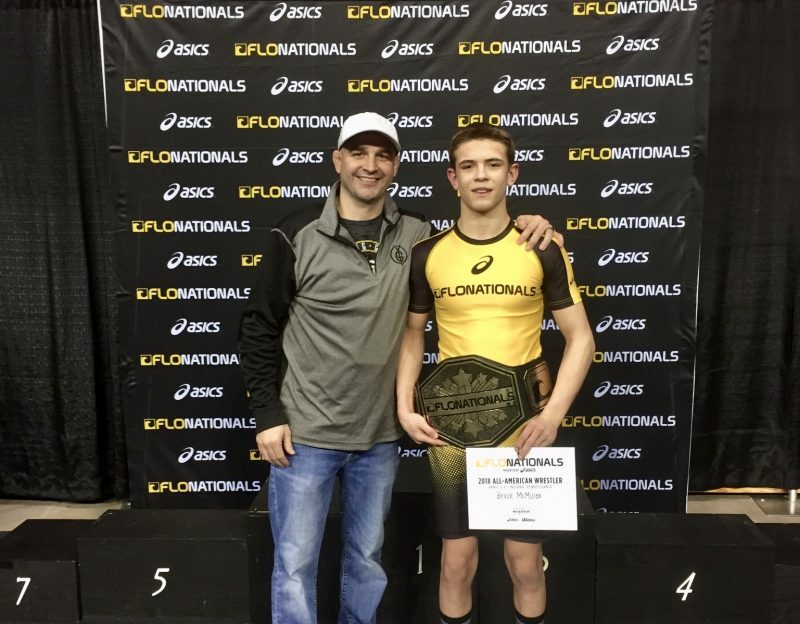 McCoy’s teammate at Chestnut Ridge Jared McGill was also a silver medalist at the FloNationals – falling to N.C. State recruit and the #14 ranked wrestler in the Nation, Tyler Barnes of New York, by a 10-9 score. Canon-McMillan sophomore Gerrit Nijenhuis was second at 160 pounds and PA State Champion Josh Stillings (Pennridge) was a runner-up at 182 pounds, falling to the #3 ranked wrestler in the Nation, Jared Krattiger (Wisconsin). At heavyweight Michael Wolfgram (Central York) had his hands full with the #1 ranked wrestler in the Nation Mason Parris (Indiana). Wolfgram was pinned by Parris in the first period to take second. Check-out below where all the Pennsylvania medalists finished on the podium below and visit the FloArena for full brackets.